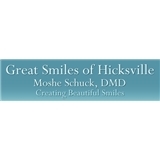 Great Smiles of Hicksville (Hicksville) - Book Appointment Online! Dr. Schuck explained the procedure clearly and discussed any questions before he began. The procedure was quick and painless.